I love the beauty and simplicity of this data visualisation. Why look at numbers in tables when they can be displayed in a more appealing way – one that conveys information, patterns and trends so clearly and quickly. I created this time grid visualisation after seeing the trulia trends House Hunter visualisation, tweaking it for my own needs. Session data is pulled automatically from Google Analytics for the past 30 days, and plotted using D3.js to show the most popular day and hours for browsing. Data is from a retail client is a retail site that sends high value home decor. As expected, traffic ramps up at lunch times and in the evenings. Saturday, Sunday, Tuesday and Wednesday between 8pm and 10pm are peak times. Notice the striations of navy blue that weave a diagonal pattern from top left to bottom right. On Monday, people are busy at work and don’t come to the website until the evening. From Tuesday onwards people become more lax, starting their research at lunch, and doing more in the afternoon. As with all data, we must ask ourselves ‘So what?’. What can I do with this data to improve my business? Clearly there the evening slot between 8pm-10pm is a peak period. There are potentially more people searching for the types of product these guys sell who never reach the site. One option should be to have additional PPC campaigns running during these hours through both Facebook and AdWords. Another option would be to run a retargeting campaign in the evening that attempts to recapture those who were browsing at lunch. It would be wise to time promotions, offers and competitions to either start or end at 10pm, encouraging the high volumes of traffic on the site at the time to take action. 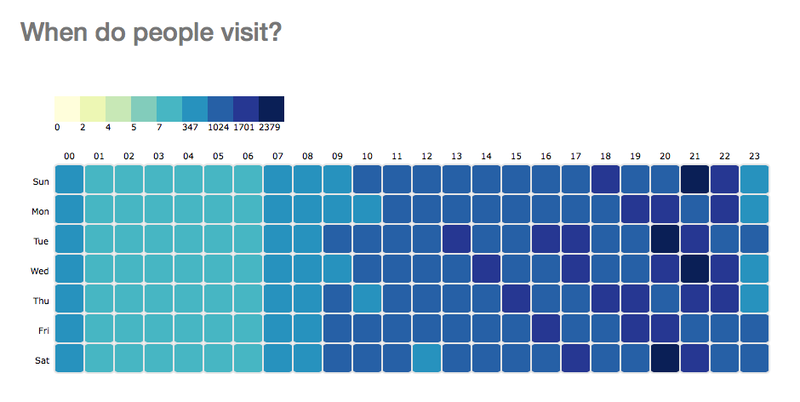 Want your own data visualised? I’m working on a tool to allow people to quickly build these types of data visualisations from their Google Analytics data in seconds – no knowledge of coding necessary. If you are interested, drop me an email.